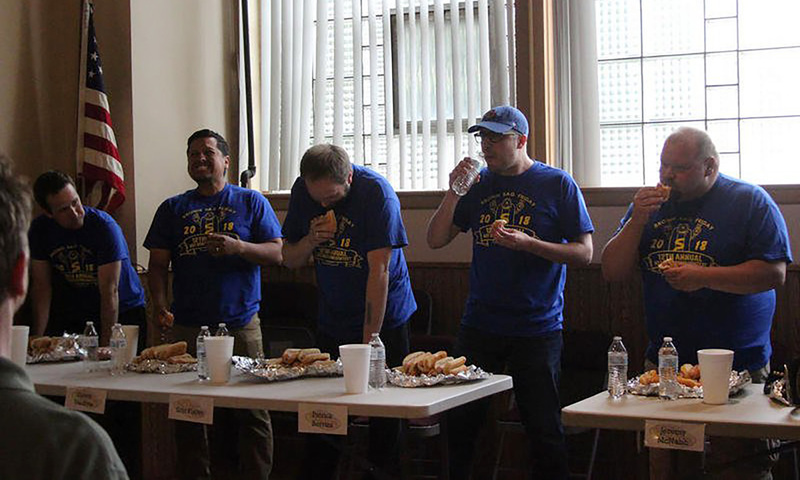 A little rain couldn’t stop the 12th annual Grundy County Bank-WCSJ/WJDK Hot Dog Eating Contest on Friday. The event normally is held on the courthouse lawn, but inclement weather forced it to be moved to the Fraternal Order of Eagles’ hall across the street from the courthouse. The goal of the event was to raise money for charity, and eight contestants combined to bring in more than $3,000. Morris Herald-News news editor Kevin Solari, raising money for United Way, won the prize for the most money raised with $1,499. It was the seventh straight year United Way has raised the most money.